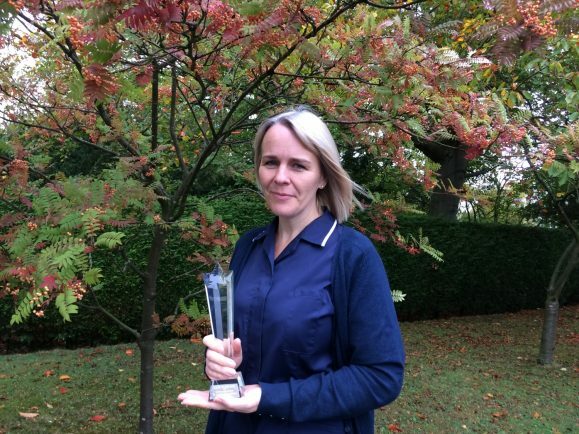 Nurse Kate Scoops National Award! A SCHOOL NURSE has won a prestigious national award for her work in supporting young deaf people’s mental health. Kate Adams of St John’s Catholic School for the Deaf in Boston Spa, West Yorkshire, scooped the Outstanding Impact category of the recent National Association of Special Schools Awards, which was held in Grantham earlier this month. She was been shortlisted for her work in developing support structures and plans to help with young people at the school’s physical and mental health needs, which can be complex. Nurse Kate developed a programme which brings together school staff and external mental health professionals to alleviate these issues. Her work to increase understanding and management of mental health and improve the support of students’ mental health needs has had a profoundly positive impact. Head Teacher at the school, Ann Bradbury, said: “Kate’s work has helped us understand and support the young people’s mental health within school and this has had a profoundly positive effect, not just for the students themselves, but also for the staff team who feel better prepared and more able to support them effectively. St John’s is a specialist school which supports children and young people who are deaf and hard of hearing, have communication difficulties including autism spectrum conditions or multi-sensory impairment. It provides both residential and day school placements.